We believe there is great value in being seen among a select group of reputable, local businesses. Our local, customized coupon booklets feature a great variety of restaurants & service providers, making it an anticipated arrival in consumer mailboxes. The great thing about advertising with us is that you can track your return on investment. Counting your coupons is the most obvious way. You can certainly gather lots of great information about your customers, both new and old. But, this type of marketing takes you far beyond coupon counting! Your company is branded as the consumers view each and every ad in our booklet, regardless of whether that consumer chooses to redeem your offer. Our local appeal allows you to become a household name to those consumers viewing your coupon. Our geographic and demographic specific mailing zones allow you to mail to your ideal customer. No wasted coverage! Not zip code saturation! We get you in touch with consumers most likely to do business with you. We also target households with the highest incomes—and the spending power! According to AC Nielsen, 94% of Americans use Direct Mail Coupons. Consumers anticipate their arrival! We place your ad directly in the hands of those consumers. 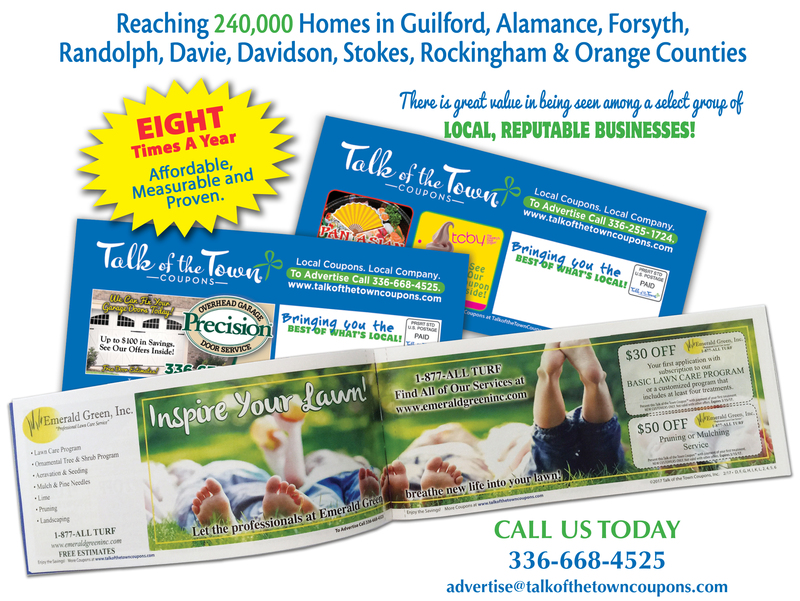 Feature your company with premium ad placement in the Talk of the Town Coupons® booklet. Front cover ads are seen right away when the consumer opens their mailbox! Your ad is there, greeting consumers each time they pick up their booklet! With our convenient format, shelf life is extended over other types of advertising that people receive in the homes. Our neat, easy to use, upscale booklet lends itself to your ad being viewed numerous times as the consumers browse through the booklet again and again. Full bleed cover space will set your company apart! Options include: Inside Front Cover, Inside Back Cover and Back Cover. Call us for pricing and availability. Space is limited, so hurry. We’ll make your business the “Talk of the Town”!